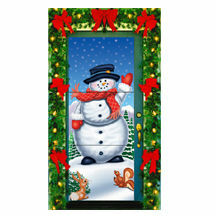 It will always be a white Christmas at your home with this jolly Snowman on your front or back door. From the moment winter arrives and well into the New Year, it will add a touch of warmth and good cheer on even the coldest winter day! Size - 30" by 75"